When you go to college in the United States you expect to learn–not just in a classroom about history, science, and math, but also outside of it. Spending four years on a college campus in America is known to give you experiences that teaches you social skills, independence, and how to be responsible. It is designed to prepare you for what is next in life, whether that be a job or graduate school. But as many things as the American education system gives you and prepares you for, nothing compares to what you gain by taking the opportunity to live and study abroad in a foreign country. By studying abroad in France I have learned the virtue of patience beyond measure. I arrived in France at the beginning of September and with my single suitcase in hand I nervously moved into the room I had rented at my host family’s house. I had decided to live with a French family in order to get as much exposure to the language as possible. 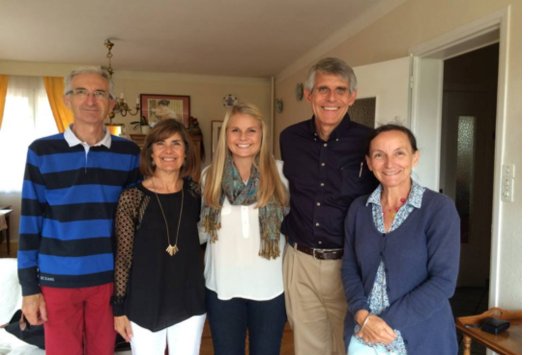 To no surprise, my wonderful host family taught me more French than I can remember. But more than just new phrases and the difference in pronunciation between tu and tous, my host family taught me how to be patient. They taught me to speak gently and not rush my words. Every single one of them reminded me not to get frustrated with myself, and they always took the time to listen to what I was trying to say. I set off the fire alarm at 8 a.m. my first week in Grenoble, and did not know how to explain in French what had happened. But rather than getting the least bit frustrated, my host-mom, Claire, was patient and took the time to not only understand my distraught and broken French, but also teach me how to use the toaster in the future. She wasn’t mad that I had woken up the entire family or made the house smell like burned baguette. She was patient and calm and showed me grace. The truth is that studying abroad isn’t all wine, cheese and weekend trips to Italy. Living in a foreign country can be lonely at times and it’s a lot harder to call, not to mention go, home when you want to hear a familiar voice. But studying abroad gives you invaluable memories and teaches you skills that you can’t learn from inside your comfort zone. For all of the road bumps one undoubtedly has while living abroad, I wouldn’t give up my time in France for anything. As they say, c’est la vie!